The pink dress is so cute!! The first one is my favorite!! Very cute!! The theia maxi is amazing. Prom was soooo loooooooooooooong ago for me, I wore a short red bandage dress. Come to think of it, it was very Herve Leger-esque. They were calling me The Nanny, ha! I really like the silver Philip Lim one. i'd totally wear the 3.1 philip lim sequin dress. similar to what i wore to my prom, but mine was bob mackie and kinda CHER haha! great post! Great picks, different from what I've seen on other blogs. The shirt dress is probably my favorite! The pink dress is beautiful! Awww prom mine was truly a night to remember. LOVING the maxi floral number. love the phillip lim! different is always good. Wow, beautiful choices! I really love the maxi floral dress, and the pink one. I feel like both of them you could rock after prom as well, which is always a plus! Prom?! Oh man!! it has been a while!! love those dresses! My fave is the Phillip Lim dress! The floral one is amazing!! And I love this Phillip Lim one, too!! So cool!! love all of them, lol. i'm new to the blog world but am really enjoying your blog. will you check out mine sometime and let me know what you think? only a few posts so far, but i'd like to knwo what you think of the concept. it's fashion tips for the frugal fashionista. thanks!!! My favorite of these is the first one. I love short prom dresses. 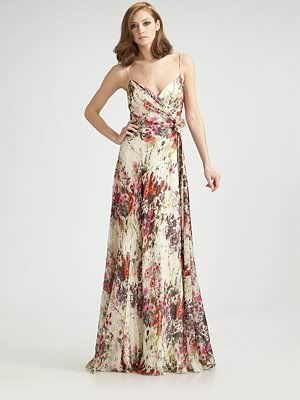 I absolutely love the flower maxi dress. Those are beautiful prom dresses. Love them. Securing the perfect dress was almost as important as getting a date. It's one of those moments in high school you never forget. It's probably a girl thing, but prom night often seems to be the most important night of your life and nothing would make or break the evening quite like the dress. Love that strapless puffed skirt dress. Yes, the sequin shirt dress is unique, but I see it more as a cocktail dress rather than a prom dress.